There are many types of masking tapes available. Each of these is created to serve a different purpose and work best when employed for that task. Adhesive tapes serve a variety of purposes such as painting; stenciling, spraying, surface protection etc. Using suitable types of masking tape for the right purpose optimizes their performance and produces the best results. Also called ‘painter’s tape’, masking tapes are a type of adhesive tape which is pressure-sensitive in nature. It is made of thin paper which is easy to tear. Available in various sizes, these tapes are mainly used in painting operations to mask those areas that are not supposed to be painted. 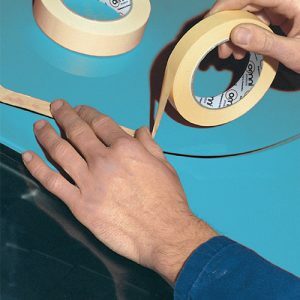 Once the job is done, you can easily remove the tape without chipping off the surface or leaving behind any residue. When it comes to masking tapes, Omni has a wide range to cater to different applications. We believe in providing our customers with customized packaging solutions to help them meet their specific needs. Each tape is designed for high performance and can withstand a range of outdoor conditions. 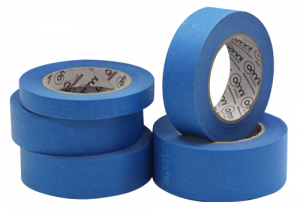 The Omni 14 day masking tape is specially designed to cater to industrial requirements. This blue single-sided paper tape has high resistance to external weather conditions such as exposure to the sun. The premium Italian acrylic solvent adhesive used in the tape is easy to remove and remains residue-free even after 14 days. 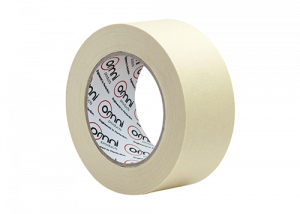 The Omni 64 Automotive Masking Tape is a waterproof, single-sided paper tape specially built to perform in wet conditions. It also has heat resistance up to 85 degrees Celsius. This natural-white colour tape is hand-tearable, making it simple and easy to use. This Automotive Tape can be used for car refinishing, repairing,industrial and other automotive applications. The tape’s premium rubber solvent adhesive gives it strong binding making it perfect for industrial applications. 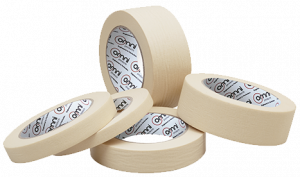 The Omni 600 General Purpose Masking Tape is a single-sided paper tape which is recommended for use in simple jobs. The tape can withstand temperatures of up to 60 degree Celsius and can be utilised for general tasks. The natural rubber used for adhesive supports its application for decoration as well as building purposes. This General Purpose Masking Tape is mainly used by painters for edging, stenciling and surface protection. It can also be used for simple decoration in households. Very easy to use, hand-tearable and stretchable up to 6%, it can be removed within 30 hours of usage. The Omni 630 Premium Automotive Masking tape is a single-sided paper tape engineered to resist temperatures up to 100 degree Celsius for 30 minutes. The premium rubber solvent adhesive coupled with 0.130 mm tape thickness makes it ideal for automotive application. This high temperature resistant tape is used for car refinishing and repairing. This Italian tape is residue-free and it is compatible with water-based varnishes and paints. Omni 630 is a high-grade masking tape, engineered to perfection and is able to function in a host of different environments. Our range of tapes is perfect for commercial and household use. With a wide range of options available, it’s important for consumers to pick the tape that best suits their purpose. How to apply masking tape? Applying masking tape correctly is an important factor to ensure you tape performs. Preparing the surface before apply the masking tape also improves performance.